a. approach with the wind. b. approach with the wind from astern. c. approach with the wind on the beam. d. approach with the wind on the bow. b. let go before you reach that position. c. let go upwind of that position. d. let go when you reach that position. a. note any change in tightness of the anchor chain. 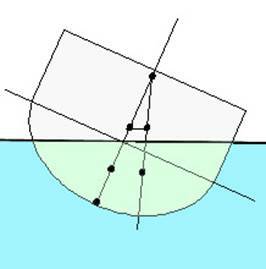 b. note changes to bearings of fixed objects on shore. c. note the angle of line paid out. d. note the bow wave. a. a coastal river bar. b. a poorly charted shoreline. c. a gently shoaling shoreline. d. a very “steep to” shoreline. c. wind speed and sheer. d. the angle between your heading and your wake. a. eased or hardened with each swell to maintain an average course. b. lashed down to prevent any movement. c. allowed to find its own position to avoid broaching. d. thrown from hard over to hard over to maintain the precise course. Match the propulsion system with the performance qualities you would expect. a. ensure the ropes stowed. b. close all scuppers and freeing ports. d. open the engine hatch. Hand signals are inappropriate in vessel operations as they can be confusing. Crew should not repeat every skipper’s steering order as it becomes annoying. a. astern propulsion steering hard to port. b. forward propulsion steering hard to starboard. c. astern propulsion steering hard to starboard. d. forward propulsion steering rudder hard to port. High speed vessels require very large rudders. a. raise the tilt trim. b. shorten the tow rope. c. lower the tilt trim. d. move weight to the back of the boat. a. a much larger swinging circle. b. a much smaller swinging circle. c. to check on her position more frequently. d. to be less concerned about the holding ground. Below is a normal twin inboard vessel as seen from the stern with a right and a left hand propeller. Draw arrows on the sketch to show the direction of rotation of each propeller. The stopping distance of a vessel is shorter when it is heavily loaded. a. secure your anchor and steam full astern. b. lower a man on the second anchor so he can lift off the obstruction. c. lower a stage and cut away the obstruction. d. secure the obstruction with a rope, lower your anchor to clear, then cut away obstruction. The reef pick is best for anchoring in sand. a. with a rocky bottom. b. with a sandy bottom. c. at times of large tidal ranges. d. when the wind is against the tide. Maintaining river moorings licensed by your State’s Maritime Authority in good repair is the responsibility of the authority rather than the license holder. a. get as close as you can so they see you coming. b. slow down to reduce the extent of your wash.
c. speed up to get past quickly. d. blast your horn to warn of your approach. a. get all the crew up on the decks in wet weather gear. b. radio a panpan to warn other vessels of the approaching poor visibility. c. determine the position of close hazards before they are lost from sight. d. speed up to get through the bad weather quickly. a. steam at the same speed as the swells. b. steam at twice the speed of the swells. c. steam at half the speed of the swells. d steam beam on to negotiate each swell. a. lying ahull with a sea anchor to leeward. b. heading the swell with a sea anchor out ahead. c. quartering the seas with a sea anchor out ahead. d. running with the seas with a sea anchor to leeward. 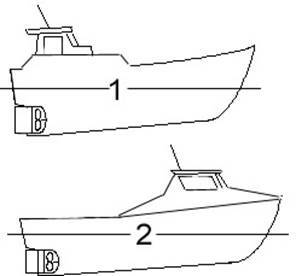 In heavy weather, trimming a vessel by the bow reduces the risk of being pitch poled. a. trim by the bow using full speed with the swells on your starboard quarter. b. ready your anchor to let go and track across the swells direction. c. edge forward with swells on the quarter using thrust to counter a broach. d batten down as for heavy weather and track in with the swells direction. a. have a considerable blind spot ahead of them. b. do not maintain a watch for small vessels. c. always stay well offshore traveling north along the Australian coast. d though slow, are highly manoeuvrable. c. the seas it encounters. d. the wind it encounters. a. lower weights within the vessel. b. raise weights within the vessel. c. load weights low down in the vessel. a. turn on the deck lights so you can see what you are doing. b. go forward to get a heaving line ready for pick up. c. keep your eyes on the person and shout for the crew to come and help. d. go below and call the rest of the crew to come and help. The faster you tow a runabout, the less chance it will yaw. a. become airborne to lessen the whitewater experienced. b. use controlled speed that avoids becoming airborne. c. use maximum speed to meet the force of the swells. d avoid the unbroken areas of swell between the white water. a. give way if you are a sailing vessel. b. give assistance to the vessel in distress. c. report the incident to the Maritime Authority. d. keep clear of this pilot vessel. An experienced crew only need to talk to each other when an emergency occurs. a. the colour of the water. d. the other vessels that can be seen further upstream. a. back in, pick up an aft spring, then hard a’starboard using ahead propulsion. b. drift in, pick up an aft spring, then hard a’port using slow ahead. c. approach head on, pick up a bowline, then hard a’port & slow astern. d. approach head on, pick up a bowline and let the wind blow you on. a. a red navigational buoy. b. a red and white navigational buoy. c. a red and black navigational buoy. d. a yellow navigational buoy. b. dawn, dusk and all night. Your single right hand propeller vessel is berthed between two other vessels. List your helm/throttle actions to depart from this riverside berth, and draw below the hawser that you would use to assist in the manoeuvre. b. going slow astern with helm hard to starboard. c. going slow ahead with helm hard to starboard. a. four short blasts on the vessel’s horn. b. one short blast on the vessel’s horn. c. two short blasts on the vessel’s horn. d. three short blasts on the vessel’s horn. a. astern with the rudder hard over to port. b. ahead with the rudder hard over to starboard. c. astern with the rudder hard over to starboard. d. ahead with the rudder hard over to port. a. the centre of gravity being too high. b. the centre of buoyancy being too high. c. the centre of buoyancy being too low. d. the centre of gravity being too low. The vessel shown in Question 18 is a stable vessel. The sketch shows a vessel approaching a shoal bank at speed. Describe the effects that would be experienced and how to limit them. Explain why a coastal river bar entrance should be navigated with caution. a. dropped while going in astern. b. veered out for to the waterline before letting go. c. walked out most of the way. d. surged out using the windlass brake. Describe three precautions for life buoy stowage. a. approval stamp, the reflective tape and the smoke signal. b. retro-reflective tape, the whistle and the light. c. approval number, the reflective tape, the light and the EPIRB. d. retro-reflective tape, the whistle, the light and the hood. List four items of safety equipment you would expect to find on board 13 metre Class 1C dive boat. Having recently bought the vessel in Question 26, your inspection includes the fire extinguishers. Describe four checks of their serviceability. Where would you expect to find the information setting out the legal maximum number of people you could carry onboard the vessel in Question 26? What would you do if you could not find it? a. limited to sheltered waters. b. limited to 3NM offshore. c. limited to 30NM offshore. d. limited to 300NM offshore. 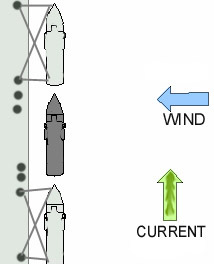 a. decreasing clearance between vessels. b. increasing the speed of both vessels. c. increasing clearance between vessels. d. decreasing the course of both vessels. a. squat by the head. b. move bodily to port. c. squat by the stern. d. move bodily to starboard. a. bow will seek the wind. b. bow will turn to port. 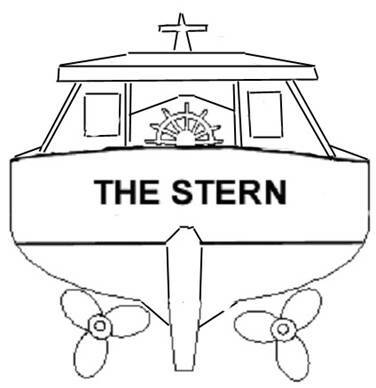 c. stern will turn to starboard. d. stern will seek the wind. b. fire a red parachute flare. a. can execute any form of turn. b. must execute an “Elliptical” turn. c. must execute a “Y” turn. d. must execute a “Williamson” turn. a. a sector spiral pattern is appropriate. b. a parallel track search pattern is appropriate. c. an expanding square search pattern is appropriate. d. radial search pattern is appropriate. With the aid of a simple sketch, briefly describe the execution of an “Elliptical” turn which is used in recovering a person who has fallen overboard. You are master of an 17 metre charter vessel who looses a passenger over the port bow whilst travelling at 16 knots. List the actions you would take to recover the unconscious MOB. a. Maritime Authority is in charge. b. tug is in charge. c. towed is in charge. d. it is always uncertain. a. overtake on his side then manoeuvre to just ahead on his heading. b. approach him at 90 degrees and stop downwind, to pass the tow. c. approach him at 90 degrees and stop upwind, to pass the tow. d. overtake on his weather side, then manoeuvre to just ahead, facing his bow. a. as short as practicable. b. secured at several points. c. weighted to reduce snatching. d. doubled up prevent yawing. a. the length of the wave crest to wave crest outside the bar. b. half the length of the wavelength on the bar. c. the length of the wave crest to wave crest on the bar. d. one and a half times the length of the wavelength on the bar. As master of a vessel, list your preparations on receiving an adverse weather report? b. pump out half the ballast carried. c. clear all freeing ports. d. speed up to get through it. Your twin screw vessel has lost it’s rudder to a rogue wave 3 miles offshore. Describe how you could control the direction of the vessel to get home. a. fire a white flare in reply. b. keep a close lookout for submarines in the area. c. alter to starboard and prepare to render assistance. d. alter to port to keep well clear. The run of the tide is usually greatest at half tide. 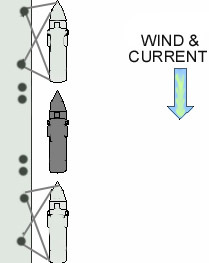 Synchronous rolling of a vessel in large seas can be reduced by a change in course or speed. a. hold the vessel to the bottom in deep water. b. slow the rate of drift and keep the bow to the wind. c. push a vessel along with the current. d. there is no such anchor.